Major League Baseball’s annual spring training means the welcoming back of warmer weather, the smell of freshly mown grass and another year of the Chicago Cubs not winning the World Series. Men making millions of dollars a year, the best in the world, invest approximately six weeks to refresh on the basic skills of the game. 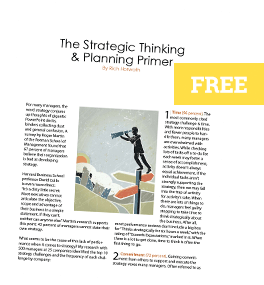 When is the last time your team refreshed on the basics of business strategy? When is the last time your team had a strategy spring training? In the past year, I’ve visited with world-class companies including FedEx and Google to discuss strategy. A common theme I’ve found in great companies and outstanding leaders is their continual desire to raise their bar of excellence and build on their already strong strategy capabilities. As the snow melts and the trees begin to bloom, this is the perfect opportunity to introduce a strategy spring training to your team. A successful strategy spring training begins with three B’s. In business, we often have this same perspective. With years of experience under our belts, we tend to think we’ve learned it all already. The reason Major League Baseball teams invest in Spring Training for their players is to refresh their skills and ensure they are the best they can be. To help your management team refresh on the basics, consider doing some G.O.S.T. practice. The acronym stands for the basic business planning terms goals, objectives, strategies and tactics. Goals and objectives are “what” you are trying to achieve while strategy and tactics are “how” you are going to achieve them. A goal is what “generally” you’re trying to achieve, such as “#1 market share.” The objective is what “specifically” you’re trying to achieve, something like “attain a 43% market share for our service by the end of the third quarter in 2012.” Strategy is how “generally” you’re going to achieve the goals and objectives, maybe something along the lines of “leverage relationships in top 5 accounts regionally with thought-leader experiential learning.” The accompanying tactics, or how “specifically” you’re going to achieve the goals could include brochures, training binders and web-based blended learning modules.